We have lift off. 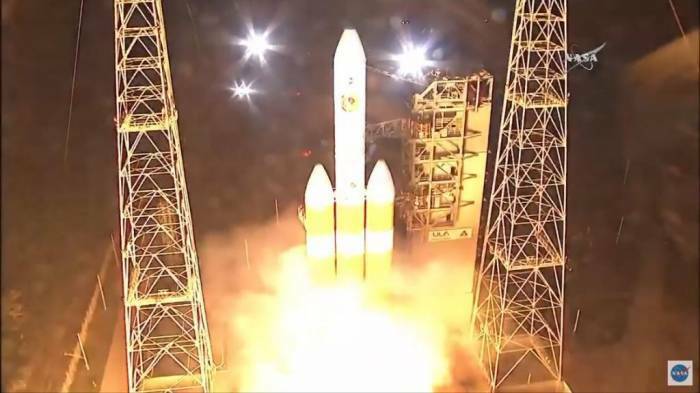 Nasa’s much-anticipated Parker Solar Probe – a spacecraft which it is said will “touch” the sun – has been launched from Cape Canaveral. The car-sized satellite was blasted into space from the Florida base at 3.31am eastern time (8.31am BST) on Sunday morning. Over the next seven years, Parker will fly directly through the sun’s roasting hot outer atmosphere in a bid to unlock some of the solar system’s greatest secrets. In particular, scientist hope it will provide information about solar winds and solar energy particles. The craft will be the fastest manmade object ever – flying at speeds of 430,000mph – and endure temperatures of more than 1,300C while looping round the sun a planned 24 times. At some points, it will move to just 3.83 million miles from the star’s broiling surface. It will constantly send back data to Earth. Greeting the launch – on the back of a mammoth Delta-IV Heavy rocket – Nasa tweeted: “3-2-1… and we have liftoff of Parker #SolarProbe atop @ULAlaunch’s #DeltaIV Heavy rocket”. One of those watching the historic moment was Dr Eugene Parker, the now 91-year-old scientist who first suggested the possibility of solar winds in 1958 and who the craft is named after. “All I can say is ‘Wow, here we go, we’re in for some learning over the next several years’,” he said when asked how he felt. Hundreds of thousands more people watched online around the globe with many sending messages of good will via social media. The mission has been more than two decades in the making with the idea first proposed in the Nineties. However, it has now been enabled by the breakthroughs in thermal engineering that will allow the small probe to survive despite the blazing heat it will be subject to. The successful launch followed an aborted take-off on Saturday morning when a last minute alarm caused it to miss its 65 minute weather window.